SNMA Member Wins $50,000 from Links, Inc.
StethoHope was inspired by the personal experiences of its founder, Ken Jackson, a second-generation Jamaican American, who witnessed the overwhelming lack of health care resources in impoverished communities around the globe. Use code “UABSNMA” when you purchase your stethoscope to receive a 5% discount. With every purchase, Stethohope will donate medical supplies to caregivers in need around the world. Donating supplies to medical facilities in need will allow StethoHope to aid physicians in better servicing their patients and improving their practices. Visit stethohope.com today! Alana C. Nichols, rising third year medical student, was one of five recipients of the Links, Inc. Inaugural Scholars in Medicine Scholarship. Worth $50,000, the scholarship is designed to provide financial assistance to African American female medical students who have shown dedication to both scholastic achievement and health-centered community outreach. Alana attended the annual Links, Inc. meeting in Indianapolis, IN, where she accepted this prestigious award. She was also able to connect to a network of thousands of professional African American women. "I have had the absolute pleasure of experiencing the definition of #blackgirlmagic this weekend. From chatting it up with Symone Sanders and Mayors Lance Bottoms, Weaver and Freeman-Wilson to kisses on the cheek and words of inspiration from Dr. Vivian Pinn and Former National Bar Association Presidents Pamela Meanes and Beverly McQueary Smith, I am beyond amazed from the outpouring of support and this experience alone would have been enough. But to be a part of the Inaugural Class of the Links Scholars in Medicine and share this honor with four other dynamic women is truly unbelievable." This year, 5 students represented the Birmingham chapter of SNMA at AMEC, the annual SNMA meeting, in San Francisco, CA. The chapter was recognized for many achievements, including winning a Community Service Grant and 2nd Place at the Community Service Poster Session for the Integrative Healthcare Summit. Alana C. Nichols was also awarded National Member of the Year for her tireless work on both national and local levels. MAPS Liaison, Alicia Williams, was also elected to the Region IV MAPS Liaison position. For a chapter so small in number, we received great recognition from our national affiliate. On February 24th, the Birmingham chapter of SNMA hosted its largest healthcare summit since its inception 14 years ago. Approximately 200 high school and college students and their families attend #IHS2018. Vendors from more than a dozen undergraduate and graduate programs from across the Southeast attended the recruitment fair. Graduate students from across the UAB campus and the state of Alabama volunteered throughout the day. Motivational speaker and local celebrity Timothy Alexander prompted the students to seize the opportunities of the day. The workshops provided resources for students interested in careers in health professions, as well as basic information on applying to college and financial aid. Ms. Alexandria Croom's session for high schoolers, "Choosing the School That's Right For You," was a smashing success according to feedback from both students and parents. The MCAT Smackdown hosted by a representative from Kaplan Test Prep was also quite popular. Nearly every student participated interactive workshops for suturing, x-ray, and physical exam skills. Most took professional headshots in white coats embroidered "Future Health Professional." While all of these moments are worth recognition, the highlight of the day was the keynote luncheon featuring Dr. Erica Stringer-Reasor, board-certified physician in hematology and oncology (Hem/Onc) and recent winner of a research grant from the Susan G. Komen Breast Cancer Foundation for $450,000. She encouraged the students to be persistent, establish mentors, and remain open to new experiences. After Dr. Stringer-Reasor's dynamic lecture, the Healthcare Summit Committee awarded a Kaplan test prep course to Nadia Hollings, a pre-medical college student. Kaplan MCAT courses start at $2000, and many underserved students are unable to access a resource used by many of their fellow medical school applicants. So we were elated that our fundraising efforts allowed at least one person to benefit in a significant way. "...just seeing so many intelligent African Americans at one event was so inspiring. Everyone was so helpful and gave great advice! I received more inspiration and advice than I was expecting." We are so excited to host ~200 students, faculty, and volunteers on Saturday. Check out the summit schedule to begin charting your course for this dynamic day! On February 7, 2018, SNMA hosted a Lunch & Grow with the 16th United States Surgeon General and former Director of the Centers for Disease Control & Prevention (CDC). In his talk, Dr. Satcher reflected on his childhood in Anniston, AL, and how Dr. Jackson, the local physician who treated him for whooping cough when he was 5 years old, influenced his decision to become a physician. He discussed how having spent his formative years in segregated, rural Alabama impacted his decision to take a leadership role in the Atlanta Student Movement during his matriculation at Morehouse College in the 1960s. His experiences continued to inform his choices in medical school, and as the first African American MD-PhD student at Case Western Reserve University, he protested an unjust educational exercise, even at the risk of being expelled. Dr. Satcher spoke fondly of his tenure as CDC Director, including the campaign to vaccinate more than 100 million children in India against polio. He also recalled reports he published as Surgeon General, including the first on the state of mental health in 1999 and several reports on smoking and racial & ethnic disparities. Dr. Satcher credited experiences in his youth for forging his passion for seeking health equity, and he reiterated that "leadership is a team sport." After the lecture, he joined SNMA for a private dinner reception, leading a thought-provoking discussion on medical education and how students can effect change even though so early in their careers. Did you know that 70% of people who are awaiting a kidney transplant in Alabama are African American, yet African Americans do not make up the majority of kidney transplant recipients? Most transplanted kidneys are provided by living donors, who are typically a family member or friend of the recipient, and there's a vast racial disparity in organ donation. 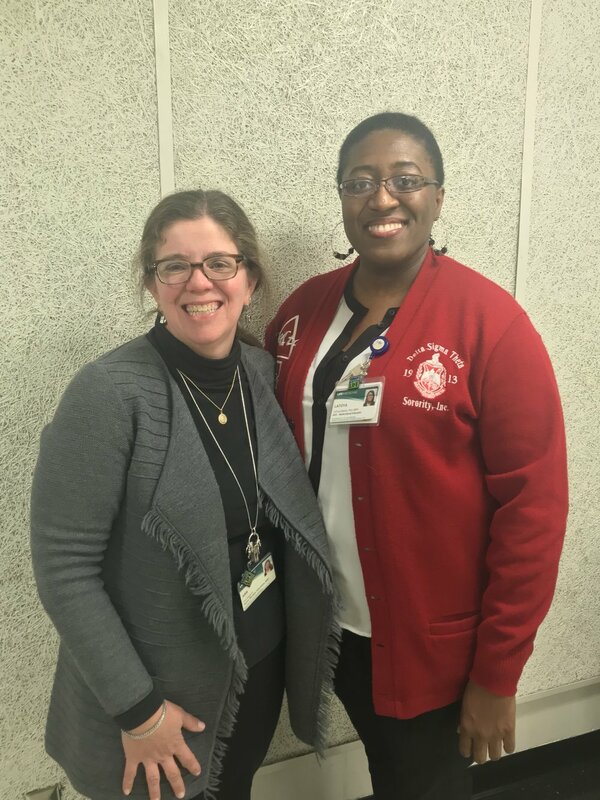 SNMA hosted a Lunch and Learn with the Alabama Organ Center to discuss the process of organ donation as well as ways in which to increase enrollment of underrepresented groups on organ donation registries. All are welcome, but some events require RSVP, so check your schedule today! Register for the 4th Annual Integrative Healthcare Summit today! This week SNMA hosted an ultrasound workshop for its members. Led by Dr. David Resuehr, Assistant Professor of Cell, Developmental, and Integrative Biology, the session included background on the mechanism and clinical applications of the ultrasound technique and an interactive activity in which students were able to learn how to perform an ultrasound. Thanks so much Dr. R.! 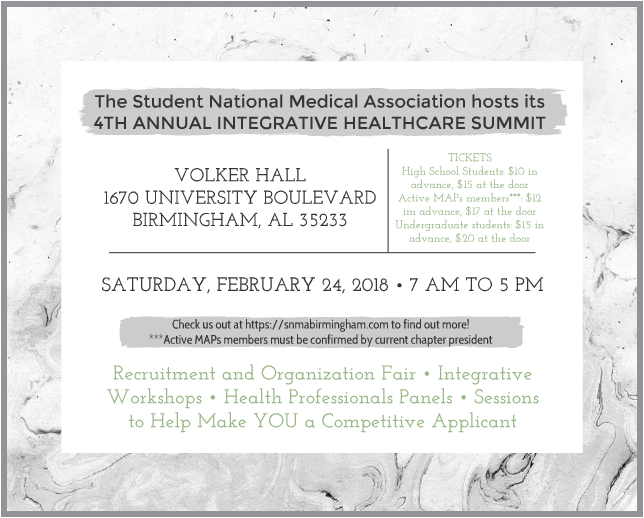 SNMA's 4th Annual Integrative Healthcare Summit Date Has Been Set!! SNMA hosts "How A Checked Box Affects the Healthcare Experience"
We're looking forward to one of our best years yet!